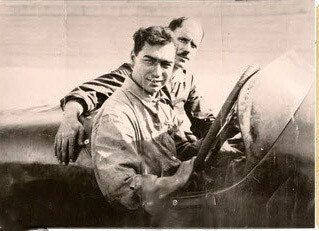 James Jandelli: "My grandfather was the mechanician Emilio Jandelli who rode with Harry Grant in the #1 Isotta for the 1914 Vanderbilt Cup Race. I can't get over seeing the film on your website of this race. The Isotta is the one seen at the start at mark: 53 seconds. Thank you. 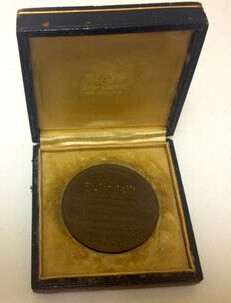 I also have his participation medal for the 1915 San Francisco race. 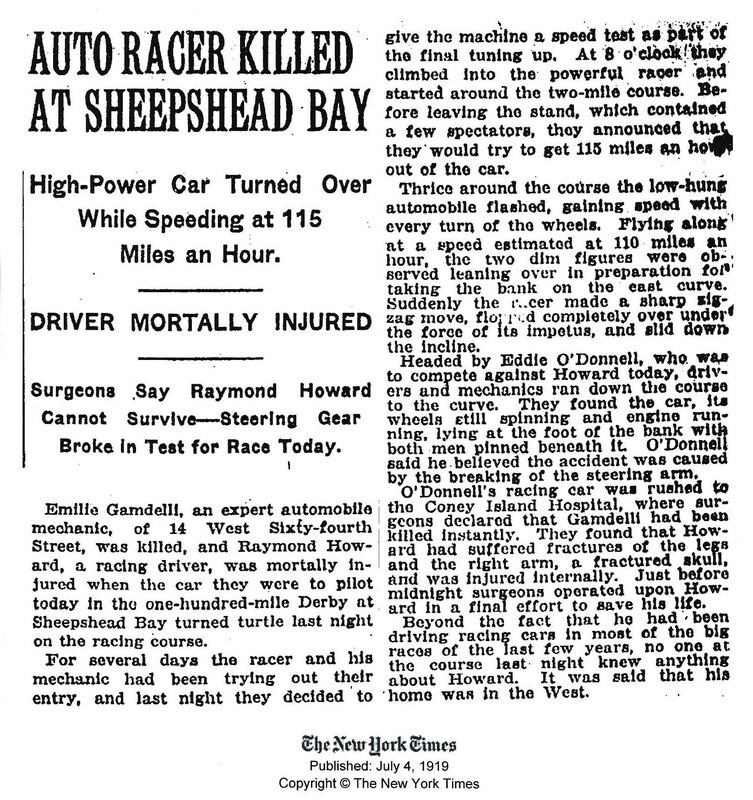 Grand Prix and a few pictures and a New York Times article from his death in Sheepshead Bay in 1919. Thanks again for this connection. Emilio Jandelli in the driver's seat. Date unknown. 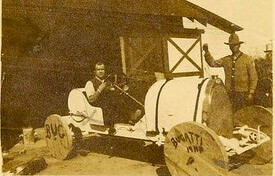 Jandelli (left) and Harry Grant (right) in the #1 Isotta. 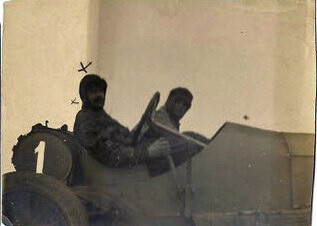 For this photo, they swapped driver/mechancian positions. The #1 Isotta at the start of the Santa Monica race. the racer broke a piston before completing a lap. Possibly the #27 Bugatti that raced in the 1915 American Grand Prize (still to be confirmed). 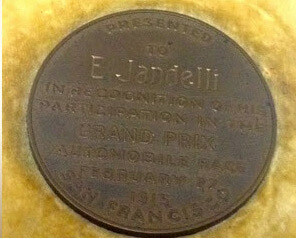 Emilio Jandelli's participation medal for the 1915 race. 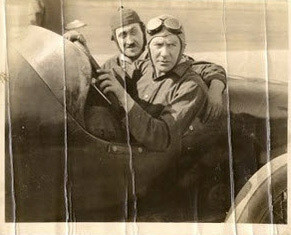 Emilio Jandelli (right) and driver Raymond Howard before their fatal practice run. Crashed during a practice run at an estimated 110 miles per hour. This is definitely an interesting footnote in American racing history. And unfortunately with a sad ending. The photos, though small, are interesting: who has ever seen a Bugatti with wooden wheels? I was especially interested in the first photo after the Chaplin movie. 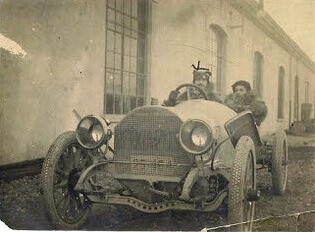 That car is clearly a Brixia-Züst (written on the radiator) and photographed in Italy (Italian registration number). What puzzles is me that the car has one detail, which is very unusual for Brixia-Züst: the curved front axle. Normally this axle is straight, though after a deep search in my archive I could find one 1908 example with a similarly curved front axle. Without holes, but the holes were clearly made for racing purposes. Based on appearance I would date the car (and thus the photo) at 1909 or 1910. 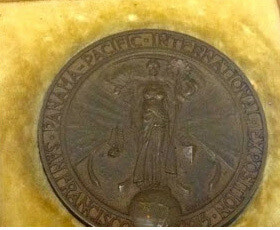 It would also be nice to find out the location of the photo, which I couldn’t link directly to the Brixia-Züst factory in Brescia, Italy. According to the monumental work by Norbert Steinhauser “Ettore Bugatti - L’artisan de Molsheim” (three tomes published by Bugattibook, Corseaux, Switzerland 2008. French language) the car is a Bugatti T 21 ordered by Stefan Kjelsen, Bugatti agent in New York, for his client Charles W. Fuller of Pawtucker, Rhode Island. 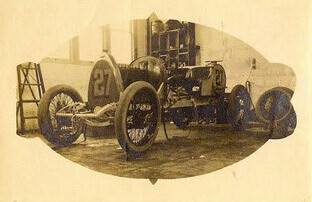 The car was entered in the Feb. 27, 1915 American Grand Prix in San Francisco, driven by John Marquis, racing number 27, white body (as compulsory for a German racing car). It was forced out after six lap. 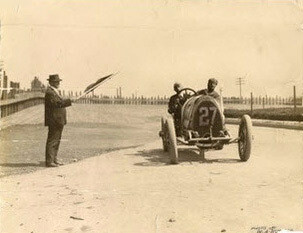 On March 6, 1915 the car was entered in the Vanderbilt Cup, driven once again by John Marquis and carrying the same race number 27. The car was forced out at lap 16. The published photos should have been taken at the American Grand Prix when a huge 150-litre rear tank was used. In the Vanderbilt Cup the normal tank plus an extra 50 lt. tank was used. 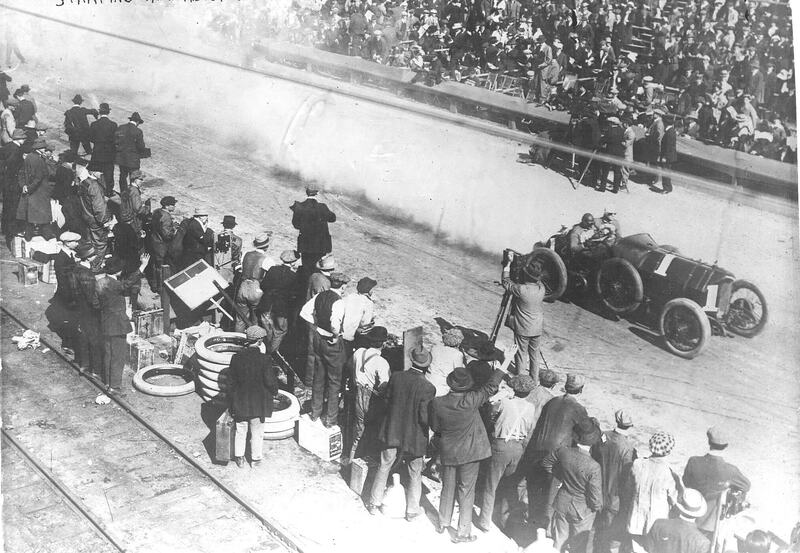 The same car was later entered in the California Grand Prix (March 17, 1915), the 1915 Indianapolis 500, and finally in the Narrangansett 100-miler, Cranston (Rhode Island) on Sep. 18, 1915. All the above is taken from Tome 2 pages 62-69.